Born in Handan, Hebei Province in 1974, Wang Limin has participated in 15 group exhibitions in China, Japan and Korea as well as a solo show at the Pickled Art Centre in Beijing. 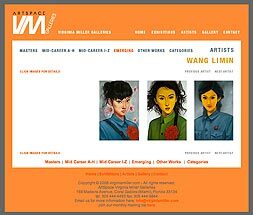 Two of his large-scale portraits of attractive young women dressed in military-style uniforms of the Mao Zedong era from the “Under the Radar” exhibition are given full-page color illustrations in the definitive catalog, “2007 Chinese Contemporary Art Document.” The red crysanthemum on the chests of two of the portraits symbolize celebration, luck and a life of ease–all the antithesis of being conscripted into a military organization. Orchids raining down on one subject symbolize perfection, abundance and higher growth, hardly attributes of a soldier’s life. Clearly, Limin’s perception of the Cultural Revolution is less than Utopian.